There are lots of reasons why we as Books on First are happy to be here. One of the best reason is the appreciation people have shown through public displays of affection and praise. 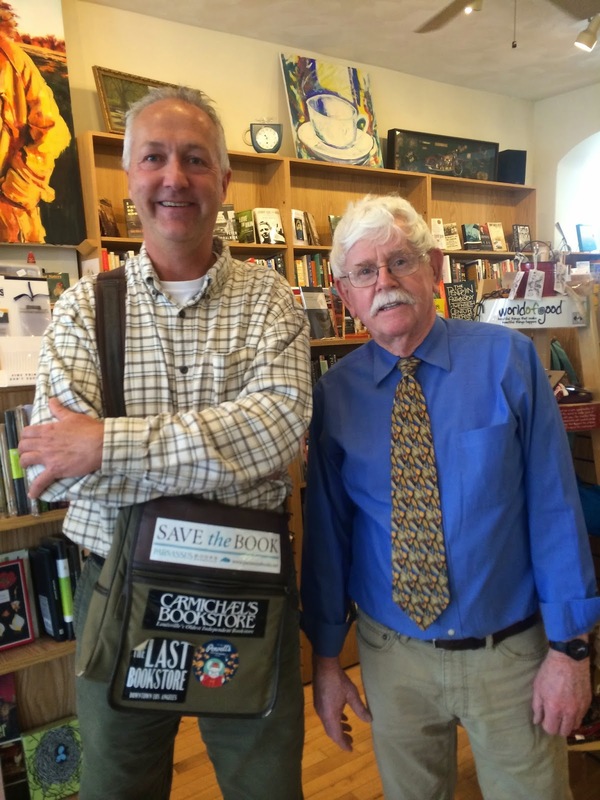 Bob Manson is travelling around the country, visiting independent bookstores, blogging and hoping to write a book about his travels. Recently, he was at Books on First and spent a little time with Larry. Larry said that a man just came in and without a word started taking photographs. Later, they talked and posed together. One thing I noticed about these photos posted on his blog and facebook is that except for the one with Larry and Bob together, they are devoid of people! Gee, that says a lot about how busy we were. Check it out! It started about 16 years ago with the opening of an independent book store and cafe on a downtown street corner. That started Downtown Dixon's transformation into the worlds of art and culture. All we can say, is, We're happy to be here. And thank you, thank you very much.